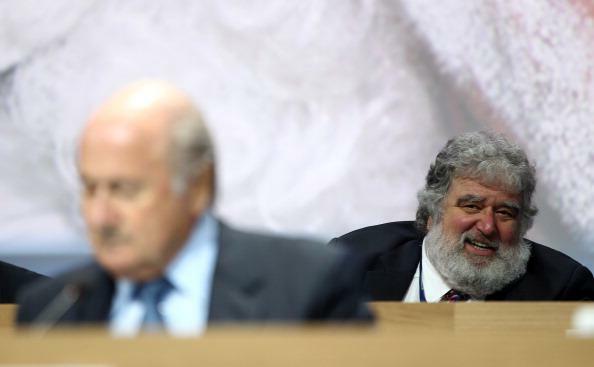 Chuck Blazer World Cup vote bribes: U.S. soccer official admitted to corruption in plea. Chuck Blazer at a FIFA meeting in Zurich in 2011. Foreground: FIFA president Sepp Blatter, who announced his resignation Tuesday. The man who was once the United States’ most powerful soccer official admitted in a criminal plea that he had taken bribes in exchange for supporting Morocco and South Africa’s respective 1998 and 2010 World Cup bids, court papers released Wednesday reveal. Chuck Blazer—a larger-than-life character nicknamed “Mr. Ten Percent” for the cut he took out of every big-money deal he was involved in—pleaded guilty to racketeering, wire fraud, money laundering and income tax evasion in 2013 in a case that was kept secret as the Department of Justice continued to investigate other powerful soccer figures. Blazer—along with two sons of Jack Warner, the former leader of the CONCACAF North American soccer federation—became cooperating witnesses in that investigation, which ultimately led to the indictment last week of nine more soccer officials, including Warner. Seven were arrested at a FIFA meeting in Switzerland, and this week longtime FIFA president Sepp Blatter resigned—just days after being re-elected—as reports suggested that prosecutors were looking to use plea agreements to gather evidence of his own misconduct. But Blatter is still insisting publicly that he’s done nothing wrong, while FIFA second-in-command Jerome Valcke claims implausibly that a $10 million payment he facilitated between South Africa and a Jack Warner-affiliated group was not a World Cup-related bribe. Even amid the general rout of FIFA’s old guard, there have been few admissions of wrongdoing as unequivocal—and few falls from grace as long and damaging—as Blazer’s. Correction, June 4, 2015: This post originally misspelled Jerome Valcke’s name.